SOLON, Ohio, Nov. 8, 2018 /PRNewswire/ -- 1 EDI Source has announced a new partner program and is quickly building a network of EDI, VAR, and ERP referral, reseller, cloud hosting and integration partners. With nearly 30 years as a B2B integration innovator and leader, 1 EDI Source is sharing their experience by ramping up their partner offerings to the market. The partner network is focused on providing each client with the highest degree of integration services and software satisfaction and is designed to help partners grow their business. 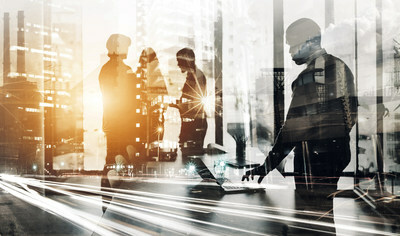 Partners in the program receive access to sales support, marketing, training, solutions support, demo environments and other enabling tool sets and personnel. <>There are 3 tiers of trade support for every partner type with varying partnership incentives including silver, gold and platinum. Silver level membership provides basic development, support, training and marketing resources. Gold members experience faster business growth, and receive access to the 1 EDI Source reseller channel, co-branded references and more. Platinum members receive all of the benefits of Silver and Gold along with qualified lead generation opportunities, joint go-to-market campaigns, market development funds and more. "1 EDI Source recognizes how indispensable Value Added Resellers are to their clients," said Jeffrey Leach, Strategic Partner Director, 1 EDI Source." "They are business advisors, services providers, software and hardware distributors and everything in between. They are truly business partners with their clients. We hold ourselves to that same high standard - being a partner first and a provider of software and services, second. Thus, our partner mission is to help VARs to expand on the trust they already have by providing the best integration solutions available." 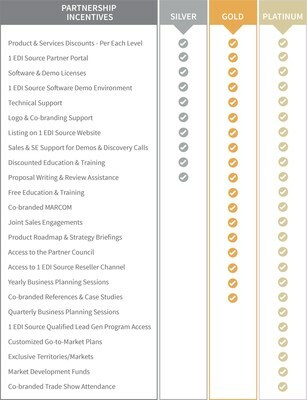 1 EDI Source has been a leader in the EDI software industry for nearly 30 years and designed an elite suite of EDI software solutions for businesses of all sizes in a variety of industries including retail, CPG, transportation, logistics, manufacturing and healthcare. Solving complex EDI problems with an innovative product line and expert in-house expert support, 1 EDI Source streamlines operations and provides large cost savings for small businesses to fortune 500 companies.